Many people know the name "Elvis". Many know "Elvis Presley". Some know "Elvis Aron Presley". Others believe it was "Elvis Aaron Presley". Few knew "E". "E" was the nickname that members of Elvis’ closest friends used when addressing Elvis. Few people are "known" throughout the World by their first name, let alone an initial, but such was the impact/importance that Elvis made on those that knew him and the millions that wanted to know him along with the billions that wanted to be himand/or be with him. Sadly, Elvis Aron Presley died (at age 42) on August 16, 1977. I recall that day many times throughout the week and it never ceases to "overwhelm" me with so manyemotions. Respect for the type of man he was. Love for the music, and entertainment, he gave us. Disappointment in the fact that he suffered many illnesses and felt "alone". Sadness in understanding that he is/was "really gone". Anger for him leaving his young daughter and for leaving so many unanswered questions. Acceptance that he is in Heaven along with his beloved Gladys. Hope that others will learn about him and the many contributions that he gave onstageand off. Sorrow for knowing that never again would I be able to "hear" an Elvis song "for the first time" which always brought a smile to my face and a "song" to my heart. Forgiveness to those who knew Elvis was in ill health and yet, for whatever reasons, were "unable" to assist him and thus prolong his life. Encouragement for Priscilla, and EPE, knowing that in so many ways they were "victimized" all the while the fact that Elvis LOVED Priscilla (until the day he died) AND EPE allowed Graceland to remain √ the fans to visit — and for Lisa Maries’ future (monetarily) to besecure. Overwhelmed knowing that Vernon would have to "endure" without his son and he was in ill health. Prayer for all of Elvis’ relatives, those who he employed, and those who loved him. Faith that he left enough of "his soul" that the name "Presley" would mean (literally) excellence and his blood, sweat, songs and tears would forever be sought by music fans Worldwide. Realization that we all will dieeven Elvis. Now that I have surpassed the age that Elvis lived, which I shake my head often unable to fully grasp that fact, I know that there are many "facets" to Elvis that either are "taken for granted" or "the story never fully told". I believe that one facet is "the promise of Elvis". Let me explain. We, as humans, "learn" through our senses (i.e. sight, sound, touch, hearing, smell). Books are filled with "lessons" but (sadly) far too many books remainunread. However, when we can CONFIRM that something was "real" and that this "reality" lived and breathed, loved and overcame, cried and shared their pain, then we "learn and accept" and it becomes "imprinted" into our heart/soul/mind and we KNOW it to berealand true. Part of the "promise" of Elvis was that we can dream. Regardless of our "status" in life, and/or lack of, we CAN dream. Part of the "promise" of Elvis is that God exists. We can praise him, seek his understanding, honor him through our endeavors, read the words of the scripture, carry the dignity of his love in our soul, and sing his praises/blessings. Part of the "promise" of Elvis is that talent is colorblind. If someone has talent it rings trueto our very soul. We FEEL it. Whether it is in the strum of the guitar, the beat of a drum, the pick of the fiddle, the blow on the harmonica, the key of a piano, or the struggle of the vocal cord to adequately represent an emotionwe FEEL it and when it is right and I mean "right"it holds our gaze and our breath while the brain processes the reality. Part of the "promise" of Elvis is that true love can be sharedopenly. It is "ok" to show your love for your Mother, Father, Grandmother, or Friend. It is "manly" to honor your word and give your heart to love knowing that love knows no "age limits". When a loved one passes it is the RIGHT thing to do to mourn and tocry and there is honor in doing so. Part of the "promise" of Elvis is the magnificence of friendship. Growing up together, sharing/making memories, does not mean that they are "gone" when one gets older or leaves an area. True friendship can be found on ships headed to another Country, under circumstances "never imagined" months earlier, and even on the stage performing for tens of thousands of faces. Part of the "promise" of Elvis is to recognize, accept, and respect the gifts that God has given us. Whether it is in singing, being a Father, becoming a Parent, writing a song, or performing in a movie that is "beneath" ones abilityto do your bestalways. Part of the "promise" of Elvis is helping others. Doing so privately, without "benefit" of IRS deductions or publicity, but the symmetry and beauty of (truly) GIVING to anotherunselfishly. To help others daily, weekly, yearly long after the music has ended. To pass along to strangers the "lesson" of giving. Part of the "promise" of Elvis is to sacrifice for your children. Whether it meant touring for months, performing when your body says "no more", or traveling great distances just to "be together". It is also to let your children know, each and everyday, that they are lovedunconditionally. Part of the "promise" of Elvis is to know suffering. To grow up without. To have it all and then for it to be gone. To be questioned by many with the most "hurtful" being questioning yourself. To know that money does not prevent life from happening or being lost. To suffer in silence and to still get up everydayand try. Part of the "promise" of Elvis is that we can be productive long past our teen years. We can be "cool" at 30, 40 and beyond. We can "feel the pulse" of new generations. We can share our stories. We can make a difference. We can be "relevant". We can excel through the harshness of cameras and lights. We can look "good" even if it means using a hair color here and there. We can feel the wind through our hair and "let loose". We can know, share, and seek love. We can be accepted. We can do. We are not "dead" after marriage, children, etc. We can still function at the highest degree. We can still learn and moreoverteach. We can try new things and hold onto those "older" things that work. We can obtain, and seek, wisdom in thoseolder and (sometimes) in those younger. Part of the "promise" of Elvis is to honor ones’ Country. To take pride in the Flag. To honor those who gave their lives. To accept, and make the best of, the fact that many times ones Country will askthe unthinkable and to stand up √ smile √ and say"yes". Part of the "promise" of Elvis is to be human. To laugh. To smile. To be embarrassed. To be ill. To love. To care. To hope. To dream. To try. To think. To strive. Each of these things never taken for granted for they convey to others just how much we ARE alike and how we express ourselves withoutwords. I am THANKFUL that I grew up in a World where Elvis was allowed to beElvis. I don’t mean the Elvis that is a "snippet" of news or an "annual gathering" but EVERYTHING that is/was Elvis. For all the "joy" he gave from celebrating the rhythm of "Thats All Right Lil Mama" to being on top of the World with songs like "Dont’ to losing so much and hearing it in "Solider Boy" to coming back and hearing "Fame and Fortune" to the Hollywood songs from "Blue Hawaii" to "Your time hasn’t come yet baby" to the Majesty of "If I Can Dream" to adulthood of "Words" to the magnitude of "You Gave Me A Mountain" to the finality of "Moody Blue"and everything in between. I believe that the "promise" of Elvis is carried on by Priscilla, Lisa Marie, the Presley Family, EPE, and his Fans. 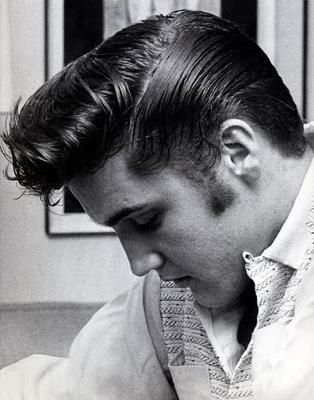 Elvis’ "imprint" remains in this man’s heart, soul, and life. I know that long after I am gone that so many others will seek out, be subjected to, and enriched by the life √ legacy √ loves of Elvis Aron Presley and that is a "good thing".I promise.